Disclosure: My family attended a media event for ICE! at the Gaylord National. No compensation was received, and my opinions are my own. The Christmas season is off to a great start here in the DC area. We visited ICE! at Gaylord National Resort for opening weekend. This annual holiday event runs through January 4, 2015. We loved this year’s theme, Frosty the Snowman. The carvers did such an amazing job of capturing the children’s faces and familiar characters. As you walk through, you follow the story you know from the classic TV special. Each visitor is given a large blue parka, which helps you stay warm in the 9-degree weather. It’s cold in there! One new exhibit inside ICE! showed how master Chinese artisans carve the ice blocks, how the colors are created, and how the whole project goes from blueprints to reality. The slide room was even better this year. The two-story slides were lit from beneath, and my kids rode them over and over! FREE scavenger hunt in the hotel’s lobby and atrium areas. Pick up a Great Reindeer Roundup in the lobby, enjoy with the kids, then return to the Dreamworks office for a prize. FREE nightly holiday fountain shows with music, lights and indoor snowfall, in front of the hotel’s 60-foot-tall “candy” glass tree. Ride the Potomac Express Miniature Train for $3 per ride (or $5 for three rides). Decorate a gingerbread house or family with Gingy from Shrek in Gingy’s Gingerbread Decorating. Kits start at $35.95. Take photos with Santa Claus, starting at $22. Have brunch with Santa at Old Hickory Steakhouse on Sundays in December at $75/adult and $40/child. Tickets can be booked online or by calling 301-965-4000. Prices start at $27/adults and $20/kids ages 3-11 for non-peak days (weekdays). Tickets are $34/adults and $28/kids for peak days. They offer a military discount. You can also get discounted tickets through LivingSocial. 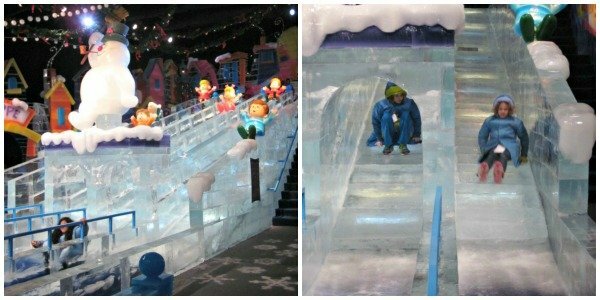 Overnight guests get unlimited admission to the ICE! attraction throughout their stay when booking a package. The ICE! Is Nice Package starts at $229 for a family of four and includes one-night room accommodations. The Christmas on the Potomac Package starts at $255 for a family of four and includes one-night, a $100 resort credit to use toward restaurants or the spa, and a souvenir ICE! photo. We’ve made seeing ICE! 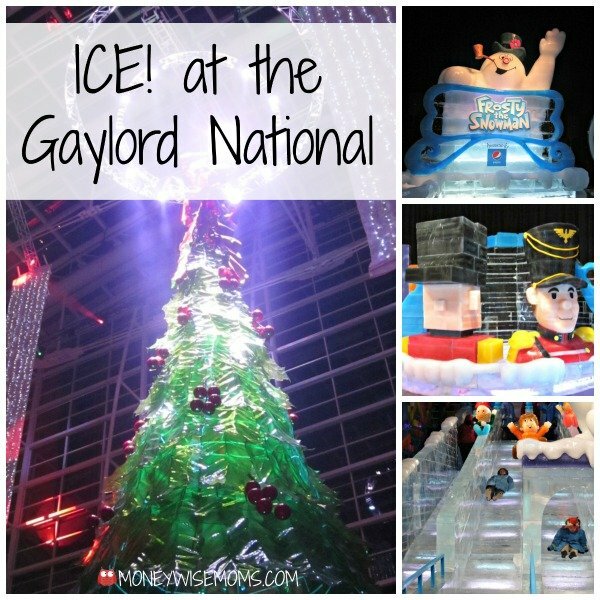 at the Gaylord National one of our winter traditions. I hope you will, too! Great news! You can also experience ICE! with Frosty the Snowman at the Gaylord Hotels in Nashville, Kissimmee, and Dallas.